•	Have you got any questions or suggestions? •	Are there any local issues which are causing concern? •	Come along and let your voice be heard on the future of Keighley. You will have the opportunity to quiz town councillors on any concerns or queries you have on the future of Keighley. Councillor Shabir Ahmed was confirmed as the new Town Mayor at the Town Council’s Annual Meeting in May this year. He takes over the robes from the outgoing Mayor, Councillor Javaid Akhtar. Councillor Ahmed said he felt privileged and honoured to be chosen and pledged to do his best for Keighley residents, young and old. "Following on from Councillor Javaid Akhtar will not be an easy task,” Mr Ahmed said. “He's worked hard to improve the council's reputation and to restore faith. If I do half as good a job as him, I will be pleased." Councillor Ahmed has served on the Council for 13 years and lives in Highfield. His past experience includes working for Transdev Keighley and District for 39 years. He spent some of this time working as a bus driver. Currently a duty manager at Keighley Bus Station, Mr Ahmed has also served on the council's Watch and Transport committee for many years and he has been a member of Events, Finance, Policy and Governance and Civic Centre committees. He is now looking forward to supporting all the council committees. During Councillor Ahmed's term in office, the Town Mayoress will be his daughter, Anissa Ahmed. "This has been my home town since 1969 and I wouldn't want to live anywhere else,” Mr Ahmed said. “For the trust you've placed in me, I give you my commitment that I won't let you down. I will look to engage with everyone who we represent in Keighley, whether they are young or old." EDITOR Safia Kauser Town Clerk/RFO Email: townclerk@keighley.gov.uk SUB-EDITOR Jackie Annett CONTRIBUTOR Lee Senior Allotments Officer PUBLISHER Keighley Town Council Keighley Civic Centre North Street, Keighley, BD21 3RZ Telephone: 01535 618252 MAGAZINE PRODUCTION & PRINTING Carolyne Griffin The Magazine Production Company Information correct at time of going to press. May be subject to change. All rights reserved and is the property of the publisher. © Keighley Borough Council 2016. Reprinting any part or matter appearing in KTC Connect is strictly forbidden except by permission of the publisher. All copyright of images/content remains that of its photographer/author. Every effort has been made to gain permission to publish copyright material however, where efforts have been exhausted, we have published on the basis of ‘Fair Use’ to comment factual based material where by its use is not central or plays a significant part to the entire publication but to act as an aid for historical and educational purposes only. This publication is offered as a limited print run. The publisher makes every effort to ensure that the magazine’s contents are correct. However, it cannot take responsibility for any effects from errors or omissions. Keighley Borough Council does not accept any responsibility or liability for any of the services or products provided by the advertisers. We bring you the latest news on our audit reports, the future of the Civic Centre, the Cenotaph's facelift, the Mayor’s Charitable Trust and our charity dinner to raise money for Airedale NeoNatal unit. How Keighley residents marked the 400th anniversary of William Shakespeare on April 23. We look forward to Keighley Armed Forces Day, show you how we’ve been saving lives with defribilators and tell you how to apply for a grit bin near you. ACCOUNTS UPDATE See exactly what we’ve spent our money on during the last 12 months. We've loads to look forward to this autumn and winter including the Pensioners' Christmas Lunch, Remembrance Day, Tea Dance and the big Christmas Lights switch on. WOODLAND PROJECT Allotments and Horticultural Officer, Lee Senior, tells readers how the Urban Woodland Project has been blossoming. The seaside swept into Keighley this summer as the council hosted a residents' summer fun day enjoyed by young and old. UPDATE ON OUR AUDIT REPORTS A recent independent audit of the Town Council has concluded that we have successfully addressed the significant issues previously identified in past internal and external audit reports. The audit found that the council has completed a lot of work over the last 18 months which has been effective in strengthening the council’s control. Two local athletes have inspired Keighley Town Council’s choice for the Mayor’s chosen charity for 2016 and 2017. The athletes train with Bradford Disability Sports & Leisure (BDSL) and have made a positive and inspirational impact on our Mayor, Councillor Ahmed. During a visit to Keighley in 2013, they showed off their medals that they had won at the Special Olympics in Sheffield. Donations to the Mayor’s charity can be made payable to Keighley Town Mayor’s Charity. FUN RUN TO RAISE MONEY FOR MAYOR’S CHARITY Tighten up your laces and get ready for a sponsored fun run at the Marley Stadium in Keighley. On Saturday 22 October, there will be a sponsored fun run to raise funds for the Special Olympics 2017, taking place in Sheffield. Team Bradford has approximately 60 athletes taking part and 22 of these are from the Keighley area. You don’t need to be an athlete to take part. The fun run is open to all abilities and entrants are welcome to walk or run, with the distance expected to be set at between 3 and 5k. Keighley’s Mayor, Shabir Ahmed, said. “This will be a fun event to raise money for our new charity of the year Bradford Disability, Sports & Leisure. If you are interested in taking part in any way please contact Barry Thorne on bsr1@btconnect.com or 07423 431629. All proceeds raised from the fun run will go to the Keighley Town Mayor's Charitable Trust fund. Any cheque donations can be made payable to 'Keighley Town Mayor's Charity'. As you can see from our striking front page, the Cenotaph in the Town Hall Square has had a facelift! The work cost just short of ten thousand pounds and is thanks to the Town Council’s Allotments and Landscapes (A&L) committee, which invested £9,760 to treat the Town Hall Square to a bit of TLC prior to Armed Forces Day. 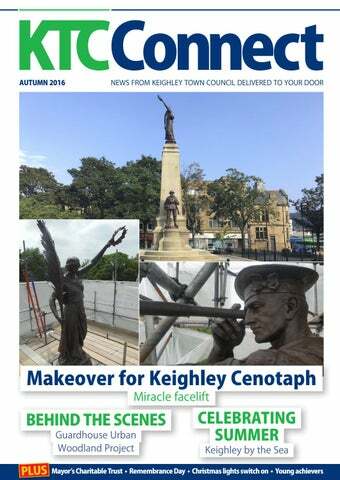 A&L Chair, Councillor John Kirby, said ‘I am pleased that the committee has been able to do something for the people of Keighley and, as the Cenotaph is in the centre of the town, it was important that the statues were maintained. The work carried out will give the statues an approximate 100-year life-span, subject to yearly maintenance works being carried out.” Local contractors, Aura Conservation, won the contract and the company worked in conjunction with Mark and Tracey Livingstone of Farmers Bronze restoration. The work was completed by the middle of June and everybody has been really pleased with the finished job. The three bronze statues and columns were systematically cleaned, which involved bead blasting to remove plantation growth and discolouration that had accumulated over the years. Three professional coats of Mahogany bee’s wax were applied, which is a specialised coating used to seal the statues and give it good all round general protection. According to the company specialists, the statues were last restored in the early 1990s. The completed works may last a lifetime, if the Council ensures the statues are washed at least once a year and one coat of waxing is applied. The company also recommends that the condition of the statues is regularly reviewed, as toxic car fumes can contribute towards how often the statues need to be maintained. The Town Council is determined to keep the Town Hall Square area in pristine condition. The work done on the Cenotaph complements the beautiful flower beds, which are maintained by Steve Thorpe, and further reinforces our commitment to the upkeep of the square. Unveiling the Guardhouse Urban Woodland Plaque Allotments and Horticultural Officer, Lee Senior, tells readers how the Urban Woodland Project is coming along. he Guardhouse Urban Woodland Project is blossoming and on 7 September, Keighley Town Council (KTC) held an event to say thank you to Wren for contributing 89 per cent of the costs. If it wasn’t for this investment, the project would not have been able to go ahead and the plaque (pictured) is our way of thanking them for their help, which helped ensure the project got off the ground. The woodland project is going from strength to strength and as we approached late summer, the majority of the newly planted trees were growing strongly. The rain during early summer was just what the project needed to aid root development in the early stages. Even better news is that damage to the trees has been minimal, far less than the 20 per cent potential loss rate we’d allowed for. The man in charge of making sure everything runs smoothly is Ian Butterfield from the Forest of Bradford. Ian has been monitoring the trees, making repairs where necessary and replanting any trees that have become uprooted. He has also been treating weeds to keep them under control, which is particularly important in the first year of the trees’ development. It’s just as important to monitor weed growth around the trees because weeds compete for moisture and nutrients which can affect the development of young trees. Despite positive progress, the site has been vandalised and walls near the cat steps have been destroyed. We have decided not to rebuild the walls but we will continue to monitor the woodland and further improve the site, subject to available funding. We are also particularly keen to encourage schools to come and visit the woodland project and use the site as an outdoor resource. Thanks again to Wren for their huge support, as well as Trees for Cities and Shaun O’Hare, who we worked closely with while putting together the funding bid. (l-r) Councillor Ian Dermondy with Town Mayor, Shabir Ahmed and Cllr Luke Maunsall. "We are particularly keen to encourage schools to come and visit the woodland project and use the site as an outdoor resource." We will assess the proposed site for your potential bin in relation to visibility, obstruction and distance from the edge of the road. If your application is approved, we will send you a confirmation letter. However, if we can't approve the application, we will then contact you to discuss why. To request that a Town Council grit bin is refilled, please call 01535 618252. For all other grit bins, please contact Bradford Metropolitan District Council on 01274 431000 or complete the application form online at www.keighley.gov.uk. Please do not take grit to use on your own driveway as this will have an impact on local road safety. Grit for clearing your footpath and driveway can be purchased at local DIY or hardware shops. Saving lives with defribilators Local MP Kris Hopkins was guest of honour at a defibrillator training event held at the Keighley Civic Centre in July. The event was organised to raise awareness of the defibrillators that have been installed around the town, which can be used in the event of someone suffering a cardiac arrest. Keighley now has five defibrillators and those who turned up to the event were given special training on how to use them. They learnt that first and foremost, the official advice is to dial 999 for guidance on where the nearest defibrillator is located. Councillor Ian Dermondy, Keighley Town Council, said: “We have been working on this initiative for the past 12 months with Dave Jones from the Yorkshire Ambulance Trust. I’m delighted that residents in the area will now have this facility which significantly increases a patient’s survival risk from a staggering 4 to 60 per cent.” The defibrillators have been funded by the Clinical Commissioning Group and organisers are hoping to ensure even more are available locally in the future. They also want to make sure people know exactly where they are located and how and when to use them. Keighley and Ilkley MP, Kris Hopkins, said: “Defibrillators are invaluable lifesaving devices and it’s important that members of the public are aware that this facility exists. But they also need to be confident that they can use them should the need arise. The work that the Yorkshire Ambulance Service NHS Trust does in highlighting these issues saves many lives and should be applauded by all of us.” Mayor of Keighley, Cllr Shabir Ahmed, added: “The event provided an excellent opportunity to show residents that they need not have any fears about using the defibrillators should they need to. Members of the community have participated in demonstrations and have discovered just how easy it is to use them.” Anyone requiring further information about these defibrillators should email responders@yas.nhs.uk. • Events to raise funds for Royal British Legion and Army Cadets. • Civic Heads attended Keighley Gala and Village Galas throughout the parish. • Co-ordinated and supported street markets, events and anniversaries. • Ongoing financial support to Keighley Town Centre. Association and Keighley Armed Forces Day Association. • Provided banners to promote events in Keighley. • Support & report to Neighbourhood Forums across the parish. • Active role at community centres across the parish, provision of school governors. 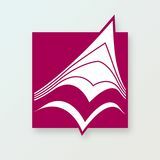 up to implement the recommendations contained within the PIR • Reports from the Council’s internal auditors • Representations from the Council including a copy of its current asset register policy and register This year also saw the Council carry out an additional three public meetings in addition to the Annual Town Meeting. The meetings were organised to allow the public to engage with the Council on local issues and to enable the Council to be more open and transparent than ever before. In addition to the eight standing committees, the Civic Centre Strategy committee was appointed to assist in determining the future and viability of the Centre. This was triggered by recommendations in a recent internal audit report and by concerns raised by the external auditor. Much of the controversy surrounding the legal status of the Centre is currently ongoing. In November 2015, the Council resolved that it had met the eligibility in Parish Councils (General Power of Competence, Prescribed conditions, Order 2012). This allows it to use the General Power of Competence as set out in the Localism Act Chapter 1, sections 1 to 8 and that it is eligible to use this power to the next ordinary election in 2015 when it must resolve that it meets the eligibility criteria to continue to be an eligible Parish Council. After the increase of 72.6 per cent in the budget for 2012/13, the Council was in a position to reduce this. Many of the reductions related to staff and Civic Centre costs. The overall council budget was reduced by 21 per cent amounting to £127,237 for 2016/17. • Implementation of the recommendations of the Internal and External Auditors through robust new governance procedures. • L aunch of the ‘Keighley Town Mayor’s Charitable Trust’ board. • Training for all new elected members of the Council. • Review of the Town Council Committee Structure . • ‘New Deal’ initiative talks with the principal authority (devolvement of services). • Management of allotments. • Maintenance and management of the Town Hall Square garden. • Continued responsibility for grit bins, provision and filling. • Active engagement with businesses by creating new links and partnerships. • Proposed transport schemes which have now been adopted by Bradford Council. • Part-funded bus services to link Bronte Country into the Keighley Parish. • Staged events such as St George’s weekend, OktoberFest and Remembrance Day. • Hosted school visits to Council Chamber and Cenotaph. • Organised training for Town Councillors across the district on planning issues. • Continued support of the Police and Community Contact Point in Oakworth. • Campaigned for commercial Boxing Day bus services. GRANTS, SPONSORSHIPS AND BUSINESS SUPPORT We provided £8,143 funding through the Acorn and Oak Grant schemes to local schools, clubs and voluntary organisations throughout the parish. This consisted of £3,000 to Keighley Armed Forces Day Association, £10,000 to Keighley and District Volunteers Centre, £6,000 to Keighley Town Centre Association and £250 annual funding to support the Christmas Day free bus service. This year, the annual Christmas Pensioners' Lunch will be hosted over two days on Tuesday 13 and 14 December 2016. Local residents aged over 65 are invited to attend the three-course meal, which will be followed by a Christmas Choir and other festivities. This event is only open to people living in Keighley and you may be asked for proof of residency and identity. There are only 100 tickets available so contact the Town Clerk office on 01535 618252 as soon as possible to secure your place. THE BIG CHRISTMAS LIGHTS SWITCH ON 2016! The date for this year’s Christmas lights switch on has been confirmed as Sunday 27 November 2016. Further details at this stage are not yet available, but we will bring you the information as soon as we have it. Keep an eye on discoverkeighley.co.uk for updates. This November we will be remembering our heroes who served our country with two special events. The garden of remembrance service will take place on Thursday 10 November in the Town Hall Square at 10.55am followed by a two-minute silence at 11am on the same day. On Sunday 13 November, there will be a parade starting at 9.30am from Russell Street. Town Mayor, Shabir Ahmed, will join Mayoress Anissa Ahmed for the Remembrance Service at Keighley Shared Church, which will start at 10am. This will be followed by a two-minute silence and the laying of wreaths at the Town Hall Square War Memorial at 11am. Following the service, the parade will march down North Street before congregating in the Town Hall Square for 11.00am. Representatives of public bodies and voluntary organisations, who wish to accompany the Town Mayor and Mayoress to the Church, are requested to assemble in Russell Street no later than 9.10am and to walk in procession in the order directed by the Parade Marshal. The order of service booklets will be available from Reverend Jonathon Pritchard of Keighley Shared Church or the Town Council office from 4 November. The Council would like to invite veterans young and old to the Drill Hall lunch for food and refreshments. This is a ticketed event only, but tickets can be obtained from the Civic Centre. Please contact the Town Clerk on 01535 618252 or alternatively contact Town Councillor Andrea Walker on 07747 685424. Forget Strictly Come Dancing and all its glitz and glamour and come and join us at the Civic Centre on Monday afternoons for a tea dance in one of the best halls in Yorkshire. Priced at £2.50, these dance sessions will only set you back 60p more than the typical cost of a cup of tea or coffee and biscuits. Dance classes last from 1-3pm, allowing a bit of time for shopping before travelling home. If you participate in most of the dances, you will have danced the equivalent of walking two miles. As well as a fun way to get fit, we promise a friendly atmosphere and good music, just contact Deryck on 01535 662121. These dance classes have been based at the Keighley Civic Centre since June 2014 and provide dance and exercise to different pieces of music, moods and tempo. The classes are suitable for all ages and no previous experience is required. The venue is right in the middle of the town and classes are held on Wednesday and Thursday afternoons from 1.30pm to 2.30pm. Organisers recommend that you wear trousers and a t-shirt, as well as comfortable trainers for safety reasons. As the health and well-being of the community is an important focus for the Mayor, Cllr Shabir Ahmed and Town Clerk, Safia Kauser, have been extremely supportive of the classes. Classes run throughout the year and the fee per class is just £2! The autumn is always a good time to try something new! It's time to get fit and maybe reduce a dress size. It’s also a great opportunity to have fun, learn a new skill and make new friends. If you’re interested in taking part and would like to know more please ring Maureen Gibson on 01535 661012. Come and show us your moves! he Great British seaside swept into Keighley town centre this summer and made a splash with a special three-day event hosted by Keighley Town Council and Keighley Business Improvement District (BID). Traditional seaside activities took over Church Green on Saturday and Sunday (30 and 31 July) and residents and visitors were treated to a pirate show, donkey rides and a Punch and Judy show. The Keighley Bus Museum Trust put on free vintage bus rides which started from Cavendish Street and drove around the town centre all day on Saturday. There was even an open top bus, allowing families to make the most of the lovely summer sunshine! On Monday 1 August, visitors enjoyed face painting and balloon modelling — and special guest Spongebob Squarepants made an appearance, even posing for photos! Spongebob also met Danny Mylo and Rosie Madison from Pulse 1. The radio presenters were hosting a special Yorkshire Day roadshow and made the day even more special with competitions, live music, performers and a visit from special guest Keighley Cougars’ head coach Paul March. The Airedale Shopping Centre was transformed into a beach throughout August with sandcastle building workshops for all the family. Keighley Town Council is looking forward to working with Keighley BID on future events. Keighley by the Sea took place from 30 July 2016 to Sunday 28th August 2016. Each year the Council agrees on how much it can set aside for grants and sponsorships and the good news is that this year saw an increase in the funding grants available for our community! If you’ve been thinking about applying for a grant, funding is available from 1 April and you can apply for a grant at any time. eighley Town Council has three funding schemes in place. The Acorn Fund for grants of up to £250, the Oak Fund for grants from £250 to £1,000 and a fund for Grants/Sponsorship exceeding £1,000. Here we explain which one might be best for you. This fund is intended for things which are unlikely to find another form of funding and are given to a person or group to help with their work in the community. There is no minimum value, but the maximum value awarded under this scheme is £250. To apply you will need to complete a form explaining what you are doing and why you need the money. If your application is part of a larger project, you will also need to complete a breakdown of money you expect to receive from other sources. You will then need to ask your Ward Town Councillor to complete a section to support your application. A member of the Council’s Finance and Audit Committee and a member of the Town Council will need to sign the form prior to the Town Clerk/RFO authorising the grant. This fund is intended to be used when the amount of funding required is more than £250. The maximum awarded under this fund is £1,000. To apply for this, you will need to complete a more detailed form and, if this is part of a larger project, you will also need to provide details of other funding you may be expecting from elsewhere. If you are applying on behalf of a group or charity which requires you to publish accounts, you will be asked to provide a copy of your last accounts. If your group has been running for less than a year, you will be asked to provide one business and one personal reference. Applications for the Oak Fund will be considered at the monthly Finance and Audit committee meetings. These applications will need to be received by the office at least seven days before the meeting. The Council is obliged to ensure that monies granted represent value for the people of Keighley and as such the following general principles are applied when evaluating grant applications. 1. O  rganisations requesting grants are asked to submit a copy of their audited accounts for the last year along with their most recent accounts or bank statements covering the previous three months and a copy of their constitution. We do this because we have to ensure there is a genuine need. If, for instance, the organisation has a healthy bank balance then we believe those monies should be utilised first. We recognise that the level of audit to which the accounts will have been subjected to will vary according to the nature and scale of the organisation making the grant application. Applicants for the Acorn Fund are exempt from this criteria. 2. Recently established organisations which do not have audited accounts, should not be discouraged from applying, but should provide a financial statement regarding their proposed budget instead. Applicants must also provide one business and one personal reference if their organisation has been set-up in the last 12 months. 3. Requests will only be considered from local organisations or local branches of national organisations where evidence of local involvement can be provided. This is important as we are under an obligation to ensure that grants/sponsorships are beneficial to the local community. 4. Organisations applying for funds should identify the specific use for the grant and outline the residents who would benefit from the grant. We need to know what you intend to spend the money on, to ensure it represents value for money and provides a real benefit to the community of Keighley. 5. In the case of sponsorship, the applicant agrees to ensure that the event is promoted as being sponsored by Keighley Town Council. We ask this in order that the contribution of the Council is recognised. 6. I n cases where applicants are successful, they will be required to provide a short written report of the award on the outcome and what has been achieved through spending the money. We do this so we can show that we are bringing benefits to the community. 7. T  he Council takes its responsibilities seriously and would not make a grant to an organisation that could not demonstrate that it acts in accordance with best practice in relation to equality and fairness. The Council seeks to minimise the potential for any discrimination in any form. 8. It is generally seen as positive that applicants are seeking funding from other sources (match funding). This demonstrates that the applicants are not solely reliant on the Council for an award and are actively seeking funds from other sources. reviewed by the Finance and Audit committee, which may make a recommendation to the next full Council meeting to award the grant/ sponsorship request. To apply for a grant, please download and complete the application form under the Grants section of www.keighley.gov.uk. Applications are also available on request from the Town Clerk's office. Please complete the sections in the application form as fully as possible and pay particular attention to the award criteria in the previous section. Your grant application will be treated as a public document and you are therefore advised not to include any sensitive information which may threaten the security of your organisation or individuals linked to the organisation. An example would be the inclusion of bank details. Standing Orders. If Members wish, they may with the permission of the Chairman, ask questions to clarify any points on the application form. All our meetings are open to the public and press except when confidential, in which case, the public will be excluded from those agenda items. Discussion of grant applications will almost always be in public. When a decision is made you will be informed of the outcome as soon as possible. This is usually by letter or email so that we have a record and so that a decision is communicated as quickly as possible. If your grant/request is approved, we aim to send a cheque to the person nominated on the application form after the next Finance and Audit or Town Council meeting. The Council wishes to ensure that monies are spent wisely and that community benefit is tracked, we therefore require applicants for grants to note the following: 1. Successful  applicants must provide receipts or other evidence of expenditure to the Town Clerk/RFO within six months on completion of the grant award. They should show that funds have been used for the purpose specified in the application. 2. A  cknowledgments of financial support received from the Council will be required on documentation and any promotional material literature or other media. Successful applicants should agree to: • Acknowledge KTC as a funder/partner in the media • Display KTC logo on publicity material • Agree to any reasonable joint publicity KTC may require • Provide an article for KTC Connect • Give permission for use of photographs in the media • Provide a statement or report of how the money has been used or a presentation (at an agreed date) • Memorandums of agreement and feedback forms will be sent to the successful applicants for completion 3. If the organisation ceases to exist for any reason prior to spending the grant, or fails to spend the monies within 12 months of the award, the Council may ask for all or part of the monies to be returned. Should you have any questions please contact the Town Council on 01535 618252 or email townclerk@Keighley.gov.uk. INTERNATIONAL WORKERS’ MEMORIAL DAY Commemorative events were held in Keighley on April 28 to mark International Workers' Memorial Day. At Cliffe Castle Park, people gathered to watch the planting of a commemorative cherry tree, which was planted near the main museum entrance by Keighley Trades Council. Councillors, unionists and pupils from the town's Holy Family School were among those who gathered in the park. Later in the morning, the day was also commemorated at the Town Hall Square, where there is a garden dedicated to Keighley man Stephen Allen and other people tragically killed in the workplace. Town chaplain, Rev Dr Jonathan Pritchard, said: "International Workers' Memorial Day is a day for remembering those people killed at work. This is an important issue as any of us could be affected — and many already are.” Former Town Mayor, Councillor Javaid Akhtar joined others for a one-minute silence that was held at noon in the Town Hall Square. This was followed by a service of thanksgiving and dedication, led by Reverand Jonathan Pritchard. Among those present was Keighley woman Judith Allen, whose son Steven — a construction worker — died while working on a Bradford building site. The former Holy Family pupil was just 23-years-old when he died. "It will be the tenth anniversary of his death next year but things don't get any easier," she said. “I never knew about the international memorial day until after we'd lost Steven, but I believe it’s really important that we think about this and continue to raise awareness of the issue.” The Workers’ Memorial Garden in Town Hall Square was opened by Keighley Town Council in 2011.